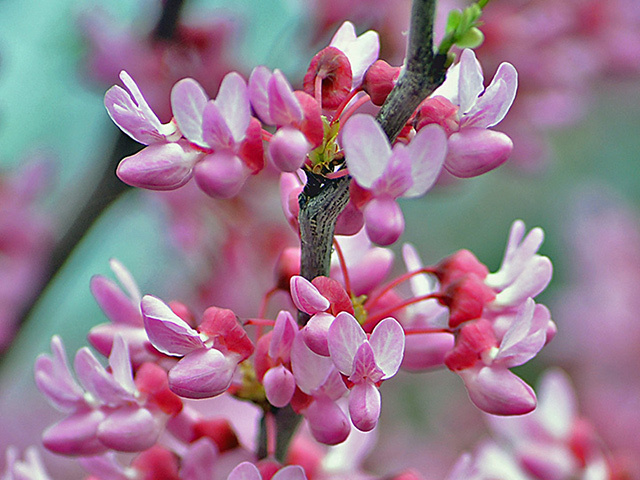 Redbuds are small trees commonly seen in the understory of our local woodlands. Redbuds typically grow to 30 feet in height, with dark, scaled bark and a short, often twisted trunk. In early spring they are covered with showy pink blooms, an early source of nectar for Hummingbirds and other pollinators. The flowers are also a favorite source of pollen for honey bees. Bean-like seedpods mature in October and persist through winter, providing food for Bobwhite Quail, Cardinals, Rose-breasted Grosbeaks and songbirds, as well as deer and gray squirrels. Redbud trees are a host plant for Henry's Elfin butterfly.